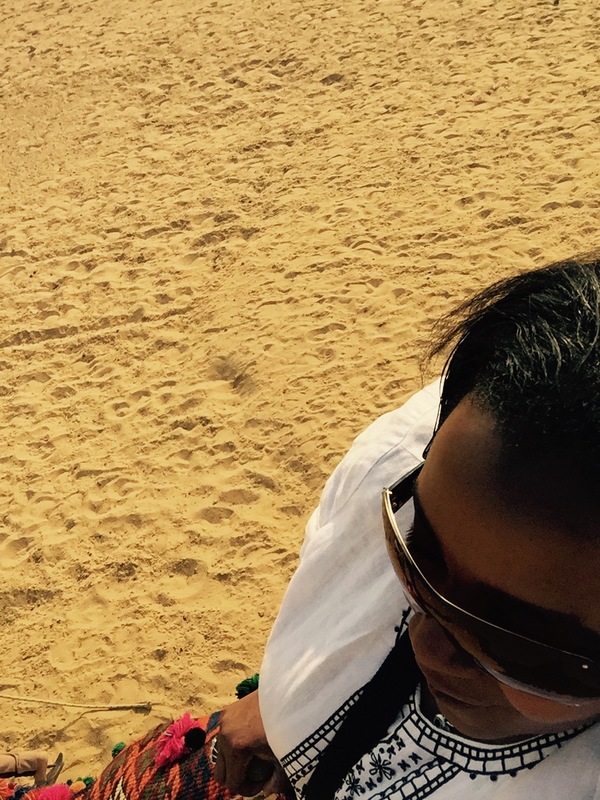 sancha Travels | My 2nd Wonder and 1st love! My 2nd Wonder and 1st love! When I decided to visit Dubai, I started to play with the idea that since Dubai was literally on the other side of the world, I could visit another country not far from Dubai that would be affordable. I therefore started to research which country I could visit that was near enough to Dubai and one that would not completely break my pocket. 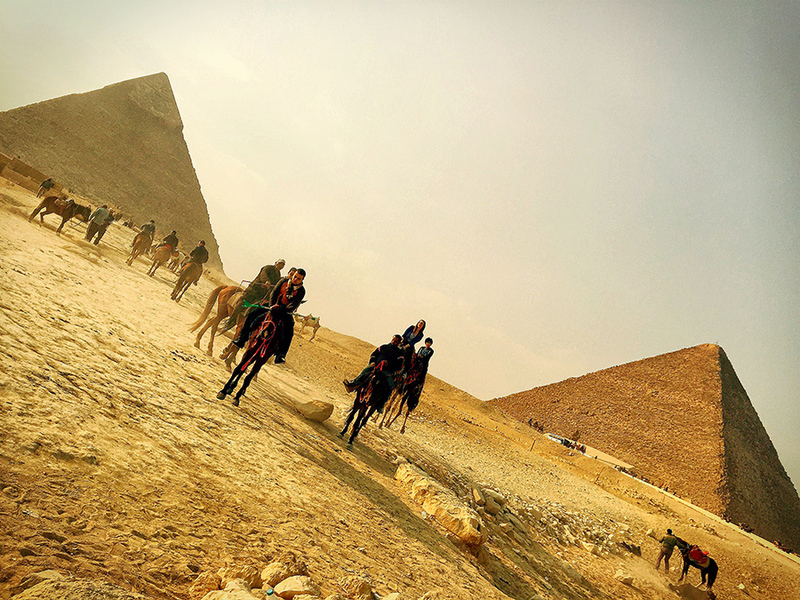 I consulted my travel agent on other places that would be worthwhile visiting on this trip, and she suggested Egypt. 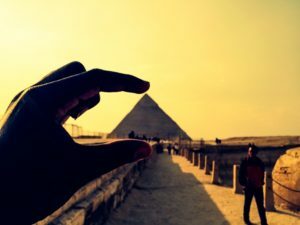 Egypt, with the great pyramids? I asked, and after further research on the country, I said a resounding “Yes” to the prospect of visiting a country that, to me held so many wonders. 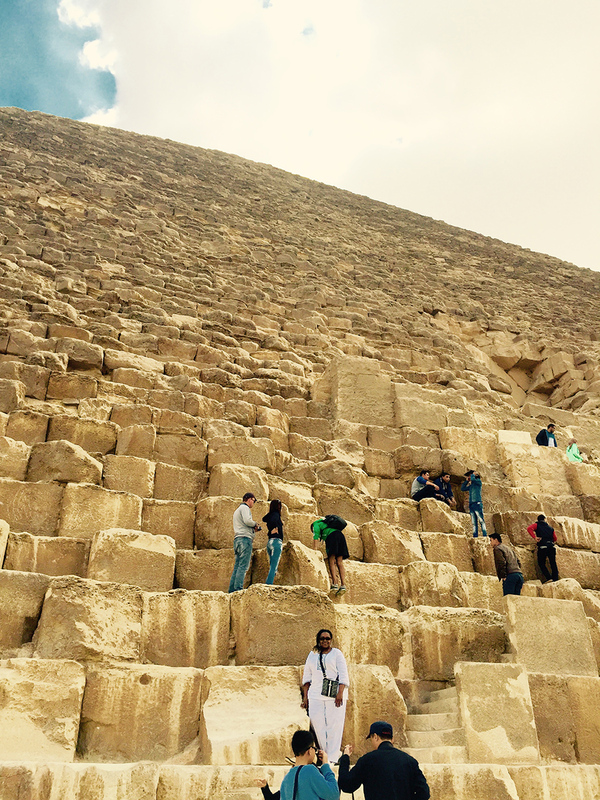 My excitement grew as I thought about the things I could see in Egypt. During that time, there were several occurrences in Egypt that caused trepidation to both my family and friends who were concerned for my safety. 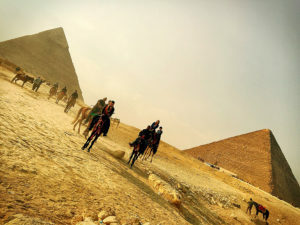 I decided that regardless of these occurrences, I would feed the rebel in me, and I became even more determined to visit Egypt. My visit in Dubai lasted approximately 5 days, 4 of which were spent with my friends trying to persuade me not to go. 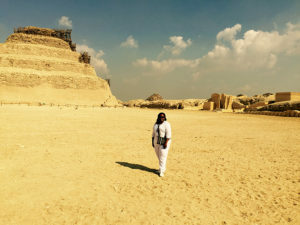 Something unexplainable drew me to the prospect of seeing Egypt, and nothing could, at the time, change my mind otherwise. 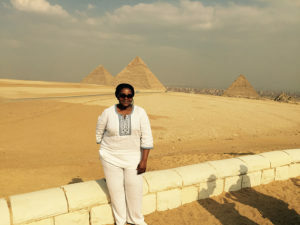 There were even Egyptians living in Dubai who thought it unwise for me to travel to Egypt at that time. 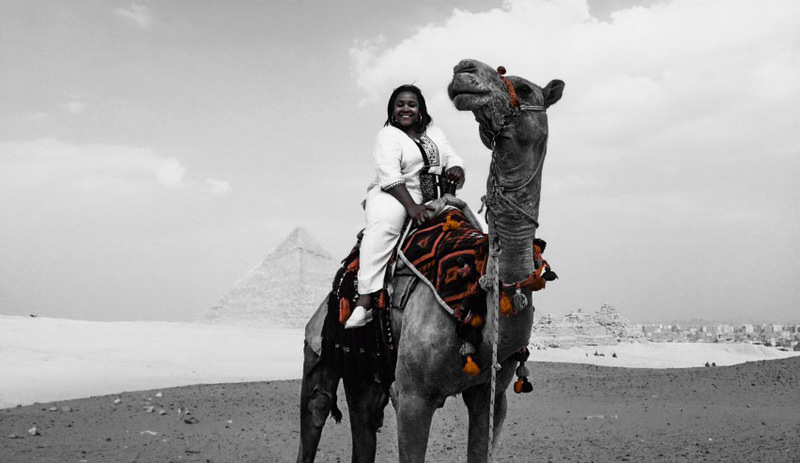 My thoughts were, “well, my ticket is booked, and I have no plans to back out now.” Besides, I asked myself, “what’s the worst thing that could happen – there were no travel bans; so I took my chances and headed off to Egypt to the land of the pharaohs. The flight from Dubai to Cairo International Airport was a short three and a half hours. On descent, I witnessed the most breathtaking view of a city sprinkled with dessert sand. Driving through the city of Cairo reminded me of driving through Jamaica’s capital, Kingston; or maybe, even worse. The streets of Cairo are full of cars, and I came to learn that this was the norm, and that there is an actual art to navigating traffic in Cairo. Egypt boasts one of the world’s highest rates of road fatalities per mile, and I quickly came to realize that driving is indeed a challenge. Even seasoned residents of Cairo must use extraordinary care and awareness to navigate the hectic streets of the capital. Enough about traffic, cars and road rules! 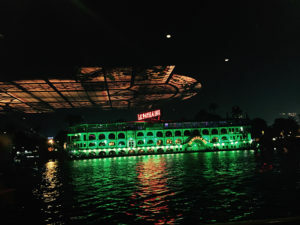 My first adventure was a River Nile dinner Cruise. The word “Nile River” evoked childhood memories of Bible stories of Moses and the Pharaohs, and I wondered how very important this river must have been to ancient Egyptians. 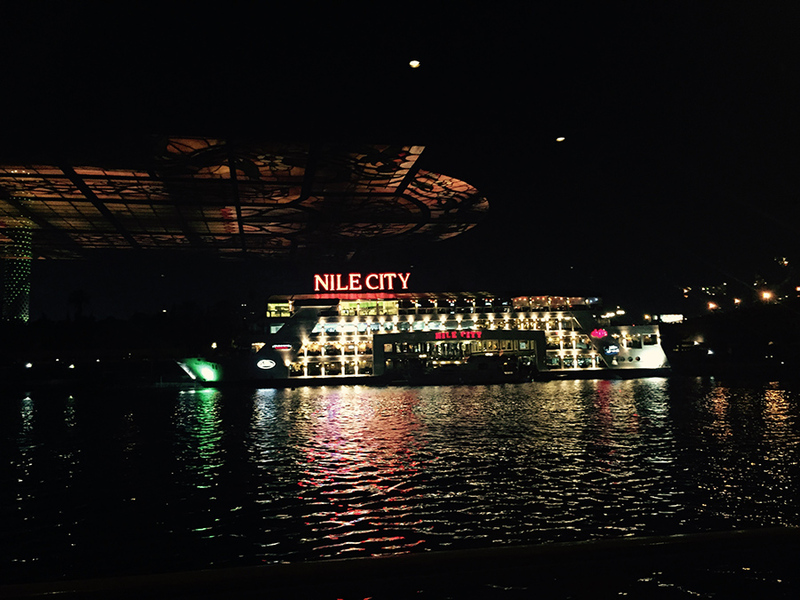 One could imagine how societies must have developed and thrived on the Nile River. I was so excited to know that I would now be sailing on these same waters that saw the rise and fall of great empires. 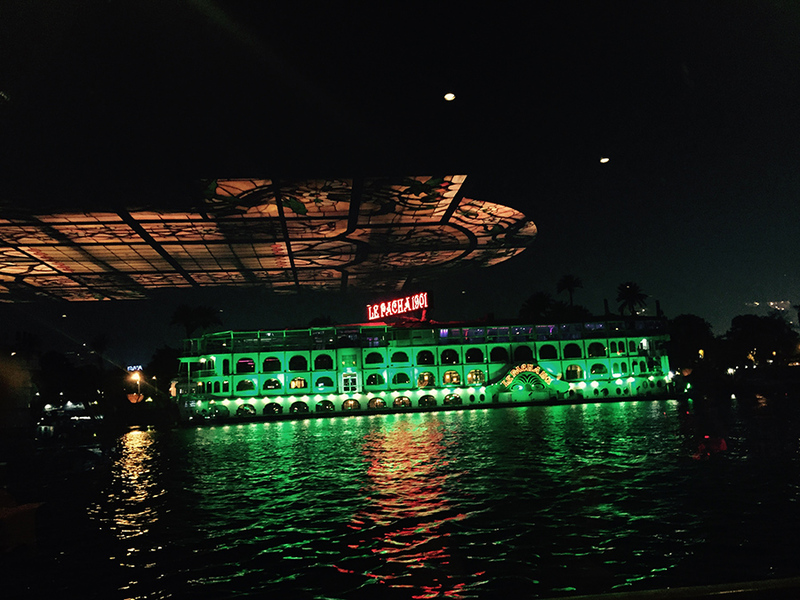 There were several boats on the river, all lit with bright lights and fun animations that made the water glisten flamboyantly. 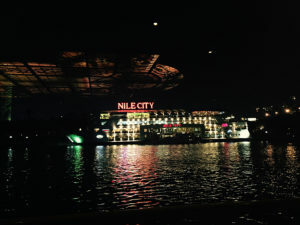 The Nile is the world’s longest river at about 6650km and your Nile journey could be anything from an hour-long sunset cruise, to a 12-day tour through Egypt. 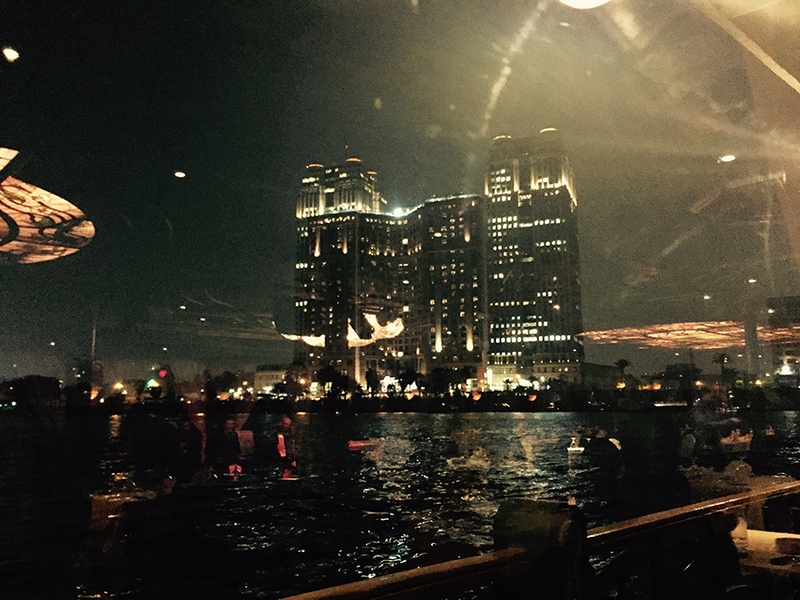 Our boat sailed carelessly down the Nile and although we did not venture far, the views were nothing short of amazing. 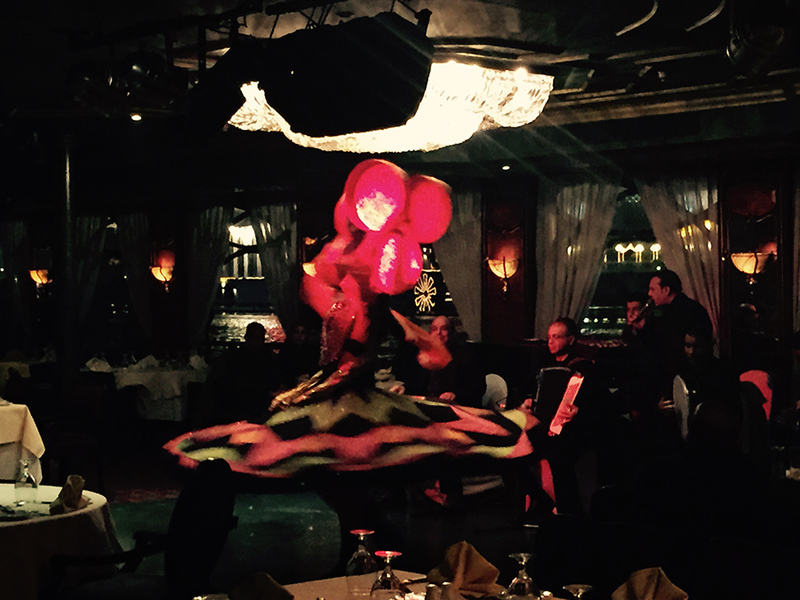 We feasted on a lovely buffet of local Egyptian dishes and were entertained by vibrant music and belly dancing. The dancing and gaiety became the highlight of the night as all the guests participated, and we vied for the best belly dancer. To say the least, we realized that we were not going to be recruited any time soon to be entertainers. However, we gave it our best shot! The following day was our visit to the ancient pyramids, namely Memphis, Saqqara, and The Great Pyramids in the city of Giza. Although it seemed like we covered a whole lot in one day, we were able to see visit all three sites. Our first stop was Memphis, a city and the capital of ancient Egypt. 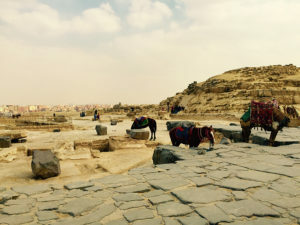 This was an important city during much of Egyptian history. 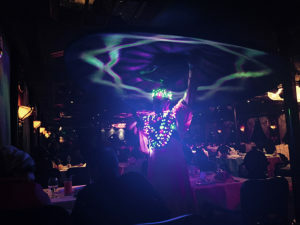 Memphis is located south of the Nile River delta, on the west bank of the river, and about 15 miles (24 km) south of modern Cairo. 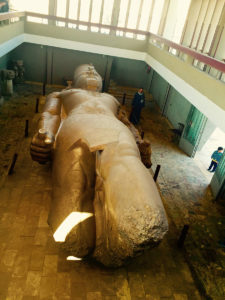 In Memphis, we visited the museum which houses a huge statue of Ramesses II. This Pharaoh was regarded as the greatest, most celebrated, and most powerful Pharaoh. 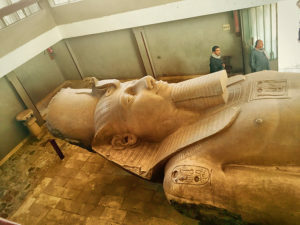 He was known as Ramesses the Great, the third pharaoh of the 19th Dynasty of Egypt. The sheer size of the statue was mind-boggling, and one wonders about the ranges of these structures. The technological skills and precision still mystifies scholars on how monuments or statues were built without machines and modern technology. It is simply magnificent. Our next stop was Saqqara also spelled Sakkara or Saccara in English. 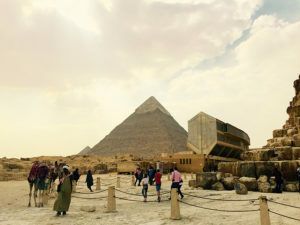 It is a vast, ancient burial ground in Egypt and its greatest attraction is the Step Pyramid, built for the King Djoser by the famous architectural genius, Ihmotep. Prior to getting to the pyramid you are escorted through the papyrus shaped column hall. This Pyramid built by King Djoser, who had moved the royal court to Memphis, would remain the political and cultural capital of Egypt until the center of power shifted to Alexandria under the Ptolemies of the Thirty-Second Dynasty. 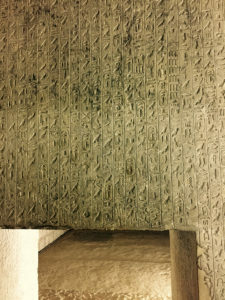 His decision to shirk burial at Abydos in favor of Saqqara, previously a cemetery for lesser nobles and high court officials, would also become the custom for Egyptian rulers. 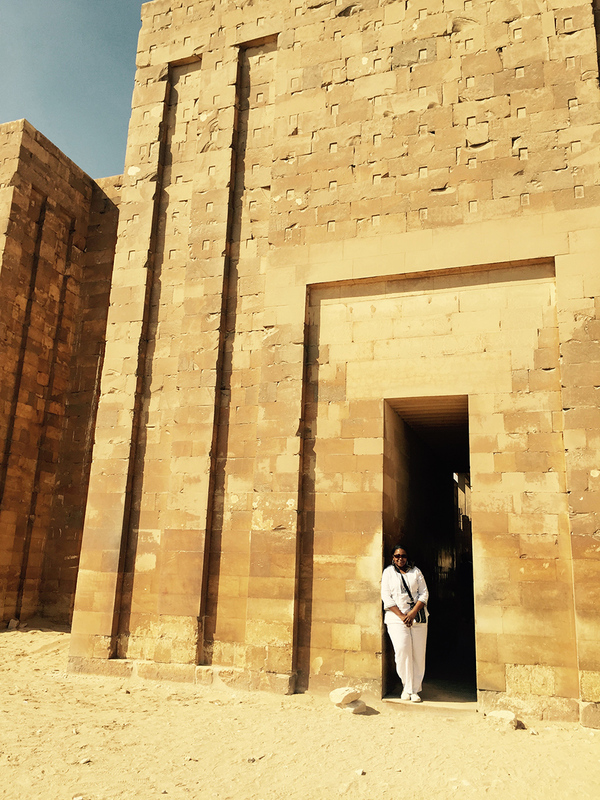 We were told by our guide that there have been found tombs of a prime minister, the son of a dynasty and a queen at Saqqara. 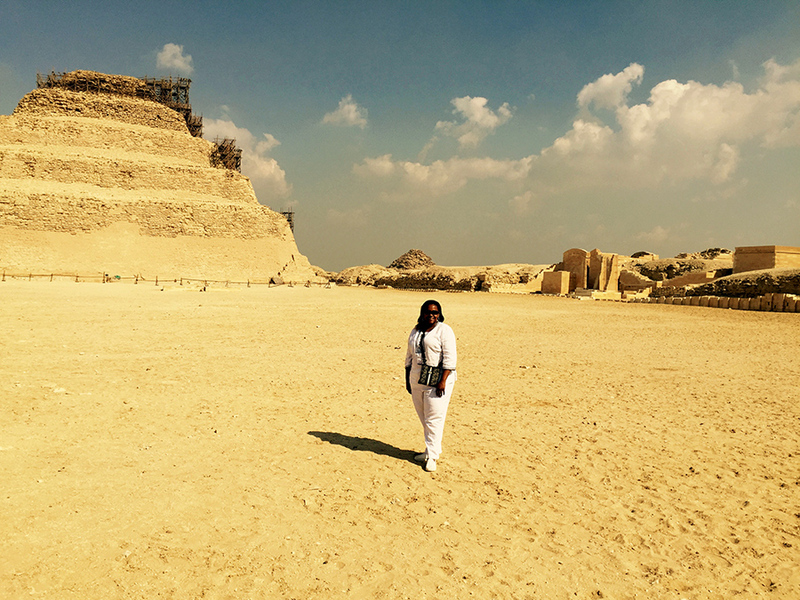 From Saqqara we drove another 20 minutes where we arrived at the Great Pyramids. 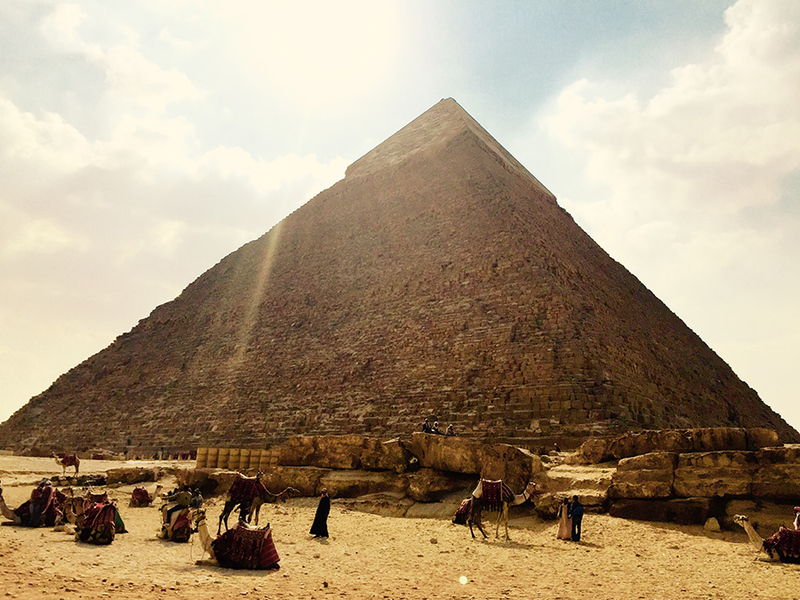 The oldest and largest of the three pyramids at Giza is the only surviving structure out of the famed seven wonders of the ancient world. It was built for Khufu (Cheops, in Greek), Sneferu’s successor and the second of the eight kings of the fourth dynasty. It is difficult to describe the overall feeling of seeing such a great wonder up close. It was real. I saw this wonder with my own eyes, and this for me, officially confirmed I was truly in Egypt. The size of the stones was incredible, and to know that several of these gigantic rocks formed this amazing structure, was truly magnificent. It became one of those moments that you hear that heavenly choir in your head singing “ahhhhhhhhhhhhhhh” as though you were entering through heaven’s gates. It was unbelievable, and amazing and literally a dream come true. In that moment nothing anyone said regarding avoiding this country, would have made a difference to me. I knew that the full magnitude of this trip was registering and imprinting a life time memory for me. I had no regrets. Carefully navigating the steep ramp taking me down into the bowels of the ancient tomb I could not help but again appreciate what early archeologists must have felt when they first entered these tombs. 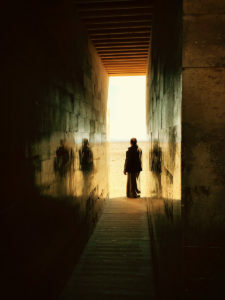 The interior chamber was quite narrow but once inside the tomb, the space was large and very cool. I can only imagine how the gleaming white limestone would have made the pyramids an even more dazzling spectacle than they are now. And there I stood, witnessing all this glory! Day three was a tour of the Egyptian museum and local market. Throughout my time in Cairo I had the same guide, so by this time I was pretty comfortable in asking questions to learn as much as possible. Luckily for me he was a brilliant Egyptologist and the questions didn’t stop. There was so much history here, so much to see and understand. The Egyptian Museum paled in comparison to the sites we visited in the past 2 days. Although it has an extensive collection, I was a bit disappointed by the exhibits. The tomb of Tutankhamun is on display there as well and is quite impressive and embellished in gold. Tutankhamun was only the age of nine when he became king of Egypt during the 18th dynasty of the New Kingdom (c. 1332–1323 B.C.E.). Hmmm!!!! I wonder how he felt ruling this vast Kingdom? As the history goes, he married his half-sister Ankhesenamun, but they did not produce an heir. This left the line of succession unclear. Tutankhamun died at the young age of eighteen. His nearly intact tomb held a wealth of objects that gives us a unique insight into this period of ancient Egyptian history. The exhibit case however was not very sturdy or secured, and I felt as though one could easily remove the case and damage the artifact. There were a few exhibits that had a similar concern. I became distracted by the exhibit style versus learning about what was on display. Maybe it’s the designer in me. Our final stop was a visit to one of the local markets. When you plan your trip to Cairo, (and I hope you will), be sure to visit a local market. Huge crowds of locals come here looking for everything their hearts desire. There is so much to see and even more, it gives you a bit of time to interact with the locals. The vibrant sights and smells of spices filled the air. What I found most comforting about it was the resemblance to a Jamaican market because of its rhythm and flow. As with any market over the world, the vendors are busy trying to get customers to buy their goods, and there is a sense of family. If there was ever something you were looking for and one vendor didn’t have it, that vendor would take you over to the vendor who did. Not to say there isn’t a hustle to all this, as in most local markets you’ll need to make bargains and try to get the best price possible. In all my experience in the market, I bought a traditional Egyptian dress, a Egyptian statues and gifts for all my friends. This totaled less than $50 USD. Although this was a short trip and with all the things I was told prior to going, I experienced nothing harmful or misleading while I was there. No matter where I travel, I’ve learned to have a watchful eye in all instances, so I was pretty conscious of my surroundings while in Cairo. But I had only experienced warm hospitality, excellent service and incredible Egyptian history. Needless to say . . . I fell in love with this Egypt, so much that I cried because I had to leave so soon; with a heart filled with comfort and a sense of home. 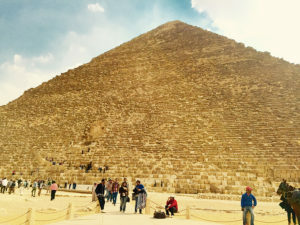 I made up my mind from that first visit that I would definitely be going back for a longer stay, to see other cities besides Cairo and to keep learning about the great Pharaohs and Queens that ruled this amazing country called Egypt. 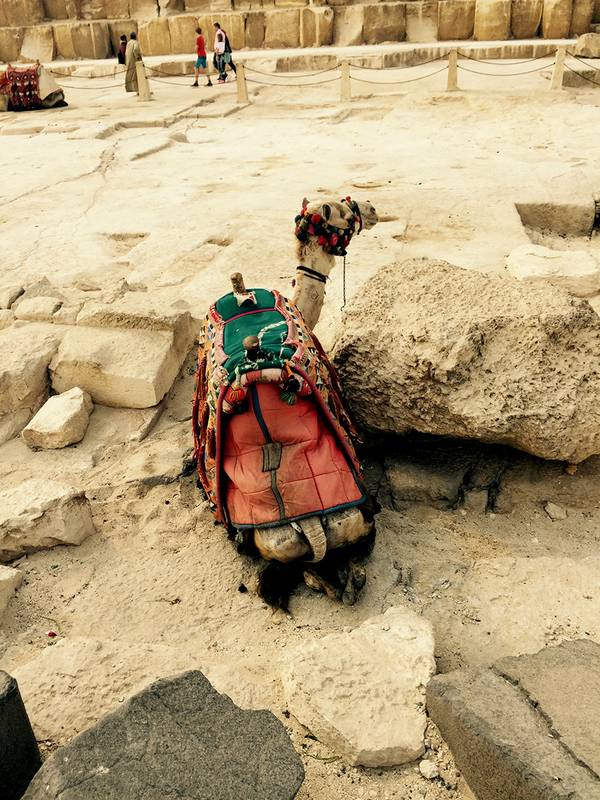 I was overwhelmed at all there is to see and learn and I knew I had to return to gain a deeper understanding about its rich history. I’m really glad I didn’t listen to the apprehensions or the fear that resides with so many people about traveling. My trip was ironically one of the best trips I’ve ever had. Egypt is still my number on place to visit. I’m in no way saying your shouldn’t travel with caution. I am simply saying . . . FOLLOW YOUR HEART! 8 ways you know you’ve found a good travel partner.